Hi Sonya - I like your name. There aren't many 'Sonya's' out there spelled with a Y. I've only met one other person who spells their name Sonya with a Y. Great question about the grapes! Put a request in at your local grocery store through the produce manager. 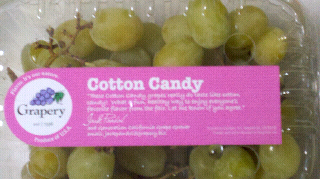 They are very yummy and worth the extra cost because they are a unique grape. They taste amazing! !